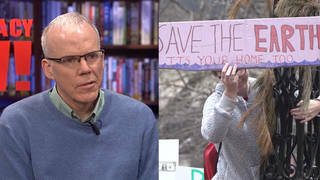 Extinction Rebellion: Meet the Famed Climate Attorney Who Superglued Herself Outside Shell’s U.K. HQ | Democracy Now! international environmental lawyer who helped draft the landmark 2015 Paris Agreement. co-founder of the environmental action group Extinction Rebellion. Extinction Rebellion. That’s the name of the movement shutting down Central London this week in a series of direct actions, as activists close bridges, occupy public landmarks and even superglue themselves to buildings to demand urgent action to combat climate change. Police have arrested more than 300 people so far, and the protests are continuing. Today, activists have halted trains at Canary Wharf—a financial hub of the city—with two protesters climbing a train car and another supergluing his hand to a train window. We speak to Clare Farrell, one of the co-founders of the environmental action group Extinction Rebellion, and Farhana Yamin, international environmental lawyer who helped draft the landmark 2015 Paris Agreement. On Tuesday, she was arrested after gluing both of her hands to the ground outside the Shell building in Central London. 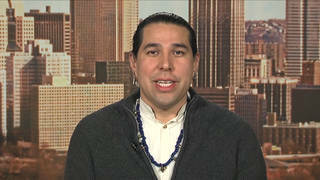 JUAN GONZÁLEZ: Extinction Rebellion. That’s the name of the movement shutting down Central London this week in a series of direct actions as activists close bridges, occupy public landmarks and even superglue themselves to buildings to demand urgent action to combat climate change. Police have arrested more than 300 people so far, and the protests are continuing. Today, activists have halted trains at Canary Wharf—a financial hub of the city—with two protesters climbing a train car and another supergluing his hand to a train window. Earlier this week, protesters shut down Waterloo Bridge and Oxford Circus, with others supergluing themselves to the British headquarters of the Shell Oil Company. This is Farhana Yamin, a leading climate lawyer and Extinction Rebellion activist who superglued her hands to the pavement in front of the Shell building. FARHANA YAMIN: Stop lobbying governments to delay action. These prove to me that the legal process is pretty broken right now. And we’re having to break law rather than make law, because of the inaction of 30 years now of these companies. AMY GOODMAN: In a separate act of nonviolent civil disobedience, four activists glued and chained themselves under a vehicle parked on the Waterloo Bridge. This is climate activist Ben Moss. BEN MOSS: We glued ourselves to this so that this vehicle could not be moved by the police last night. The reason why we’re doing that is that we want to secure this bridge as part of the actions for Extinction Rebellion. We’re doing this because we want the government to take action about the climate crisis, about the ecological collapse that we’re facing. There has been too much inaction. There has been inaction for too long. And so we’re taking radical action to make sure that the government acts on what is our collective responsibility. AMY GOODMAN: The protests are taking place across Europe and around the world as part of a week-long campaign organized by Extinction Rebellion. The group started in the United Kingdom just last year and has now spread to dozens of countries. The growing collective of activists are demanding governments commit to legally binding measures to slash consumption, reduce carbon emissions to net zero by 2025 and create a citizens’ assembly to oversee progress. Environmental journalist and activist George Monbiot wrote in a column for The Guardian, “The success of this mobilisation depends on us. It will reach the critical threshold only if enough of us cast aside denial and despair, and join this exuberant, proliferating movement. The time for excuses is over. The struggle to overthrow our life-denying system has begun,” he said. For more, we go to London, where we’re joined by two guests: Clare Farrell, one of the co-founders of the environmental action group Extinction Rebellion, and we’re joined by Farhana Yamin, a leading environmental lawyer, who helped negotiate the landmark 2015 Paris Agreement. She has now joined the rebellion. She was arrested after supergluing herself to the Shell headquarters in London yesterday. 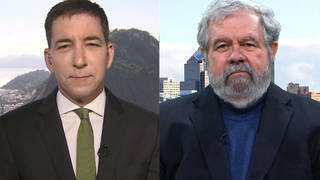 We welcome you both to Democracy Now! Farhana, let’s begin with you. You’re just out of jail. Can you explain what you did yesterday, why you got arrested? FARHANA YAMIN: Yeah. I joined the mass civil disobedience that has started in London beginning on Monday, and I did it because of the inaction of companies like Shell, who have funded campaigns of misinformation and lobbied governments to not take action, which is why we’re here at this critical time. 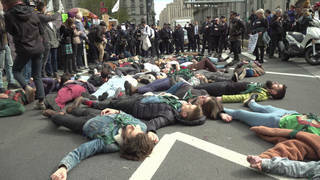 And just to let you know, that this mass civil disobedience is happening all around the world, and, today especially, Extinction Rebellion is standing in solidarity with all of those people who have been fighting climate injustice from around the world. I think there are around 50 countries that are involved in the international support for the rebellion that’s taking here in London, and each one of those is fighting against land degradation, against human rights abuses and against the toxicity and pollution in their own countries. So we salute all of those movements out in the rest of the world. Thank you. JUAN GONZÁLEZ: And, Clare Farrell, as co-founder of Extinction Rebellion, could you talk about the urgency that you and the supporters of your movement feel right now and why you felt it so necessary to do this massive civil disobedience? CLARE FARRELL: Well, yes. As Farhana says, it’s been well over 30 years of denial and time wasting, really, and we’ve pushed ourselves up against the edge of a window of time frame that we have to act. And, you know, carbon emissions are still going up. They’re set to go up again this year. So, globally, the facts are quite clear that we’re on a catastrophic course, and we’ve wasted a huge amount of time. We’re not prepared to stand by and watch us waste the very small window that we have left. AMY GOODMAN: Farhana Yamin, can you describe the action yesterday? FARHANA YAMIN: The action actually started on Monday with protesters climbing onto the facade—there’s a balcony—outside the unmarked building, which is the Shell headquarters in the U.K. And they honored the work of Polly Higgins, who has been campaigning for ecocide law, which is essentially to hold to account companies and governments for the criminal damage to the Earth. And I protested there yesterday as that action was ending, because I feel, you know, it’s absurd that I was walking off in handcuffs for criminal damage to the Shell building, when Shell itself has been one of the main biggest polluters who has caused the largest amount of irreversible, very serious harm that is happening all around the world, the climate destruction that we’re seeing as a result of 30 years of too little, too late. AMY GOODMAN: You glued your hands? FARHANA YAMIN: I did, yeah. And it’s the very first time that I’ve done anything like this, so I, yeah, probably used a little bit too much superglue, and they were completely bolted down on the pavement. I had tried to get to the door, but that wasn’t possible. JUAN GONZÁLEZ: And what was the reaction of the police to this relatively new tactic of supergluing of the various protesters? How were they able to finally get you free? FARHANA YAMIN: Well, the supergluing actions have been going on for some time, actually, and so I don’t think I did anything particularly new, other than to do that myself. And there are special solvents that they use, and the police acted with utter professionalism and courtesy. So, for me, the most important thing was to stand in solidarity with all of the people around the world who are seeing climate devastation, especially in developing countries. That’s who I’ve acted for in the climate change negotiations—the small island states, the least-developed countries, especially those in Africa, who are seeing the consequences of water shortages and will be experiencing, and already are, famines and droughts that are directly implicated by climate change. AMY GOODMAN: You’re certainly acting in every arena, Farhana Yamin. You helped draft the 2015 Paris Agreement, credited with getting the goal of net-zero emissions by mid-century into the agreement, acting on behalf of the small island nations. Can you talk about why you’ve moved from working inside the system, this agreement that you helped forge, to direct action? FARHANA YAMIN: Well, we need those laws. We have got those laws—you know, the Paris Agreement; in the U.K., we have the Climate Change Act. But they’re not delivering enough, and they’re not going fast enough. And in many parts of the world, as you know, in the U.S., Amy, that things are going backwards. We have laws that were put in place that are being repealed or being challenged or being disassembled by fossil fuel interests. So that’s why I’ve added the word “activist” to what I do as a lawyer. I feel every signal person is now called upon to join Extinction Rebellion’s call for mass civil disobedience, to see that everyone is needed, to shout out very loudly and boldly, wherever they are in the system, and to not just think that this is somebody else’s day job, you know? I’m absolutely committed to the legal process. I believe in the rule of law. I’ll carry on writing and advising, you know, when I can. But right now I feel the most important thing that people can do is come and join us on the streets, come and join whatever rebellion is taking place near you. If there isn’t one, set one up. It’s a very decentralized movement. And, you know, it’s very similar, in some ways, what’s happening here—we had 1.6 million students around the world on the 12th of March, in nearly every country in the world. You’ve got the Sunrise Movement in the U.S. I think people are beginning to wake up and understand that we, sadly, have to take different measures and slightly extraordinary measures than rely on our elected politicians, that hasn’t delivered so far. JUAN GONZÁLEZ: And, Clare Farrell, could you elaborate on the core demands of your movement to the government—tell the truth about climate change, reduce carbon emissions by 2025 and create citizens’ assemblies to oversee the process? CLARE FARRELL: Yeah, sure. So, the first demand, on tell the truth, is that we think that because of the grave risk that everybody faces, there should be a public information campaign, which should be the responsibility of any government, to educate the people if they’re in danger, and also to work with other institutions, possibly also the media, whatever it takes, the education sector, to get people to really come up to speed and understand the position that they’re in. The second demand for net-zero carbon emissions by 2025 has been amended. I believe it also now includes a rapid addressing of the biodiversity crisis. 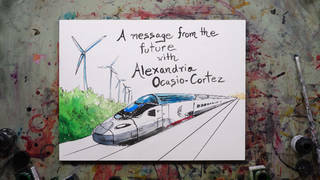 And the third demand, which I think, personally, is kind of the most exciting, is for a citizens’ assembly on climate change and the extinction crisis. And what that calls for is a structural political change, which I think is crucial for people to understand. Often when you’re interviewed on the mainstream media here, they want to drill down into policy, and they particularly want to talk about what the environmentalists want to take away from them. And, for me, this is absolutely giving something to people in a very big and serious way. And if it happens structurally, then it’s not a policy that can be, you know, massaged figures or whatever. 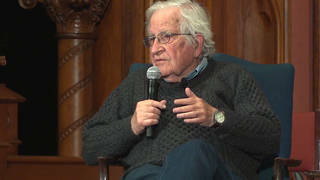 It’s something that, hopefully, will stand to last and significantly restore our democratic process in the U.K.
AMY GOODMAN: And, Clare Farrell, why you named it Extinction—why the group has decided on this name, Extinction Rebellion, and what your plans are, going forward from today? CLARE FARRELL: Well, I was part of a very long process, actually, to finalize the name. It was quite challenging. I mean, the “Rebellion” part was quite straightforward, because we had been over it, and technically that’s what we were going to organize. The “Extinction” part, I think, is extremely useful, because it helps us not only to reframe the crisis and to name the—you know, the scientific community has admitted that human extinction is a possibility now, but also it feels like it sort of takes it away from just being a climate change debate, and it helps us to talk about the broader picture, which is that we face multiple crises at the moment, and the extinction event is a big part of that. Even if we could fix climate change tomorrow, we’re still losing life at a rate which I think our society and our species can’t really survive. So, yeah, that’s on the name. And as for the plans coming up, I know that some people climbed on board the—on top of the train today at the DLR station. There are some groups on the street who—I understand, today, Oxford Circus is just receiving a much heavier police presence, and there are lots of arrests. But there will be groups going out and swarming London’s streets, which basically means going and moving, doing mobile, kind of agile and temporary roadblocks, moving around the city. So, if sites do get closed down, groups will be blocking roads in many, many places around the center of London, close to the sites that we’ve already seen closed down for the last few days. CLARE FARRELL: Just to say, this is the start of a campaign of mass civil disobedience. The intention is that it isn’t over after a few days, but the intention is that, you know, it will catalyze and inspire others to take forward their own actions and become a big mass movement all over the world. So, I hope, in the months and weeks beyond this, that we will see many, many more actions coming up. JUAN GONZÁLEZ: And, Clare, the impact of all of these student strikes that have occurred? And, of course, the Swedish activist Greta Thunberg, 16 years old, is expected to meet with the Pope Francis today. How has that affected sort of the face of the movement around climate change? CLARE FARRELL: Well, the youth movement is very important. And I think when you look at—when you look at a movement or a moment in history like this, having many movements that support each other is really important. And I had a very interesting conversation recently with the researcher Erica Chenoweth, and she described something in the States which was interesting, that the children who walked out of school over gun control, actually, if you look at the disruptive nature of disobedience and direct action, you know, when those kids walked out of school, they took up the time of the police, they stopped their teachers from doing their jobs, and they pulled their parents out of their jobs, as well, to come and find them, pick them up. And so, for children to walk out of school is extremely powerful, and actually they have a huge capacity to disrupt the lives of the adults that they have contact with. And I believe that that’s had a big impact on American politics, as well, lots of parents deciding to move into that space. So, it’s really exciting to sort of think about the breadth of the impact and the long-term impact, I think, of the youth movement, as well as the energy and the sort of excitement that they also bring. 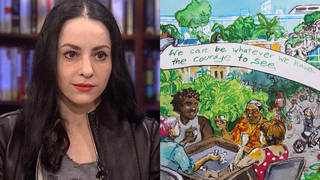 AMY GOODMAN: And finally, Farhana Yamin, as you were getting arrested, you said, “We’re having to break law rather than make law.” What message do you have to diplomats, to scientists around what needs to be done right now? AMY GOODMAN: And your message to President Trump? Thirty seconds. FARHANA YAMIN: Oh, President Trump, I think, is, in some ways, aware of how big the climate crisis is. I think he’s just dealing with it in ways that sort of deny what can be done through the creativity and ingenuity of human beings, which is that we can transform our societies, and we can use renewable energies, we can use solidarity, we can use resilience and community building, to address all the impacts that we will have. I think that that’s what happened with the moonshot. You know, we had lots of different technologies developed from that, that actually made us more prosperous and made us—you know, gave us hope. So, I hope that President Trump can put his faith in all the things that are going on in the U.S. economy to decarbonize it and to build resilience. 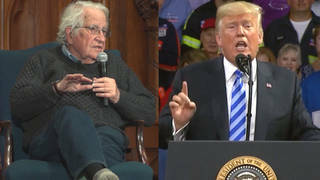 AMY GOODMAN: Farhana Yamin, we want to thank you for being with us, international environmental lawyer who helped draft the landmark 2015 Paris Agreement, that President Trump is pulling the United States out of. She was arrested outside the Shell headquarters in London Tuesday after supergluing her hands to the ground. Clare Farrell is co-founder of Extinction Rebellion. They’re both speaking to us from London. This is Democracy Now! Back in a minute.